What is the CROWN LIFE? Are YOU living the Crown Life? Crown Life is a theme, which represents a type of life. The word “crown,” as an adjective, means “The highest or most nearly perfect state of anything.” We know that the word “crown” is used most often when describing the top of something or the best of something (i.e. the crown of your head, or the crown of the mountain, or even the crown jewels.) I placed the word “crown” in front of the word “life” to create a theme, which translates to mean “To become the best version of yourself; or as I like to say it, to live the CROWN LIFE!" This is the CROWN LIFE! Are you ready for MORE? Check out the other pages on the site for more details. 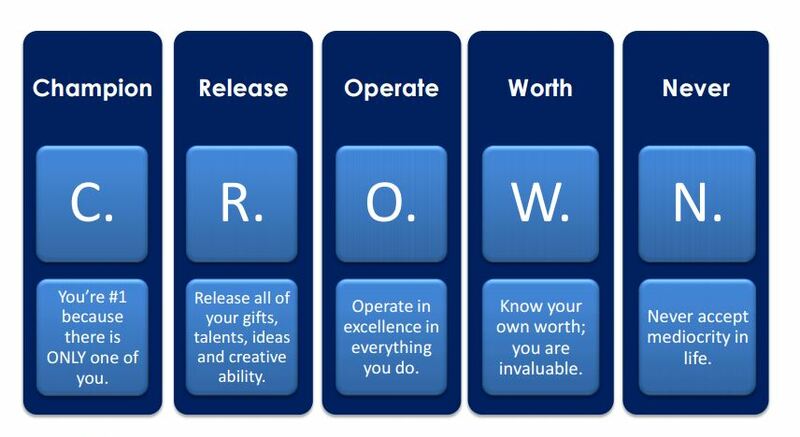 "How to live the C.R.O.W.N. Life"